Can the video-game publisher keep its market-thumping growth streak alive? Activision Blizzard (NASDAQ:ATVI) is riding high heading into its fourth-quarter earnings release on Thursday, Feb. 11. The video game publisher was one of the 10 best stocks in the S&P 500 in 2015, having just joined the index in August. Competitors Take-Two (NASDAQ:TTWO) and Electronic Arts (NASDAQ:EA) have had a good year as well, but Activision made the dominant industry showing. 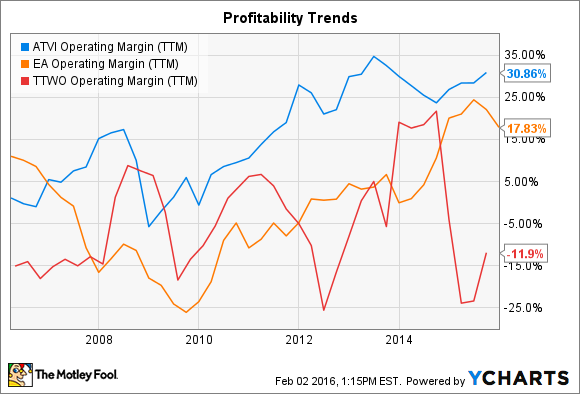 Management hiked its sales and profit outlook in every 2015 quarterly report to date. Most recently, the company posted its best-ever Q3 in terms of profit, generating $196 million of net income, or $0.17 per share. Data source: Activision financial filings. Activision's improving operating picture is being powered by two big trends that investors will want to watch: engagement and digital sales. As for rising engagement, it helps that the publisher now counts 10 triple-A franchises in its portfolio thanks to recent additions like Destiny and Hearthstone -- up from just five at the beginning of 2014. At the same time, the company is transitioning from a launch-based monetization model, where almost of the sales and profits come within weeks of a game's release, to a year-round approach that keeps players engaged with waves of fresh content over many months. You can see that shift push game play figures higher: The gamer base spiked by 27% in the third quarter as people logged a record 3.5 billion hours of play across Activision's biggest games. The shift to digital selling is also lifting profitability and helping it keep a solid lead over Take-Two and EA. Digital revenue rose 38% last quarter to a record $697 million and helped operating margin climb by 2 percentage points. ATVI Operating Margin (TTM) data by YCharts. 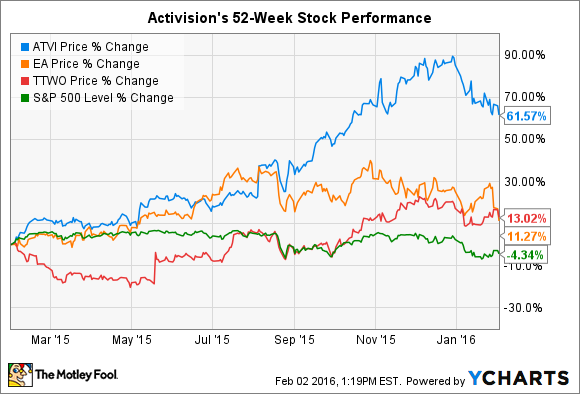 Will Activision set a new record in 2016? Kotick and his team will likely issue 2016 guidance that projects a return to record overall results. Remember, sales and earnings peaked three years ago, right before the transition to next-generation video game consoles set the software industry back. As strong as its last few years have been, 2012, with its $4.9 billion of sales and $1.1 billion of net income, still represents Activision's best yet. But consensus estimates now peg sales climbing to $5.05 billion through 2016 as profits improve to $1.58 per share. Activision will have to navigate major challenges, especially in keeping its Call of Duty and Skylanders franchises on top amid sharp competition. But even if the company doesn't see a new revenue record soon, Activision is clearly in a stronger position than it was in 2012. Rather than relying on just three franchises -- Call of Duty, World of Warcraft, and Skylanders -- for almost all of its profit, it has a deep portfolio of brands contributing to growth. And its year-round monetization model lessens risks around any single video game launch. As long as Activision can keep engaging gamers while making the most of the digital sales channel, it should continue to post industry-beating growth.